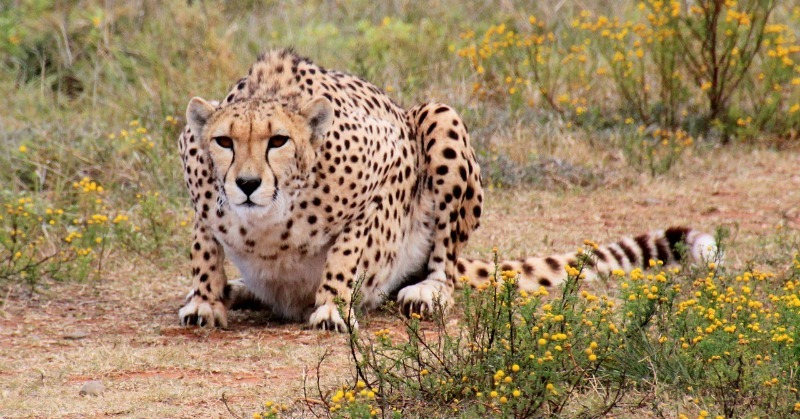 This post is a comprehensive look at the fascinating lives of the fastest animal on earth. 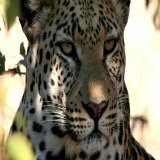 their current conservation status and some more unusual facts. 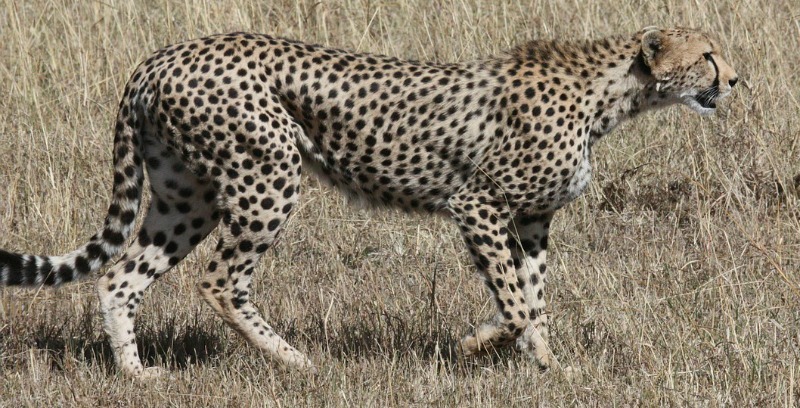 The cheetah head, body, legs and first two thirds of the tail are covered with black spots. It has a short main from the back of the neck to the shoulders. The head is small and rounded with large eyes and a distinctive tear stripe from the inner corner of each eye to the corner of the lips. The ears are small and round. 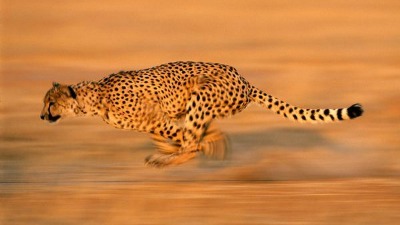 Cheetahs are equipped for explosive acceleration to a full-speed of up to 90 kilometers per hour over a short distance. 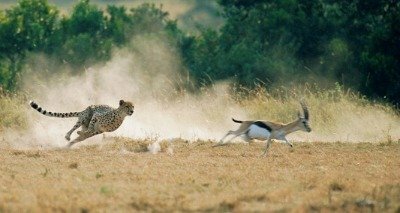 When you see a cheetah stalking its prey on an African plain you will notice how the body of this African animal is ideally built for speed. The long and slender body of a cheetah consists of small and light frame. The cheetah spine is very flexible - much like a whip. "King cheetahs" are genetic variants that have stripes instead of spots. 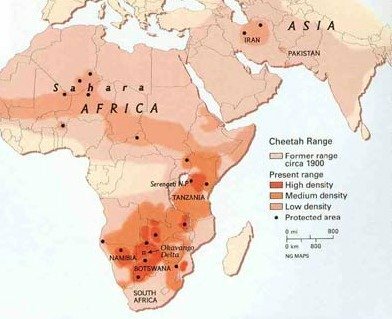 We will have a look at the specific hunting techniques of cheetahs in a moment but let us first look at their habitat. Cheetahs prefer open grassland and savanna woodland as their favorite habitat. They typically avoid forest and woodland with thick undergrowth as habitat. They can operate independent from water. How do cheetahs adapt to their environment? 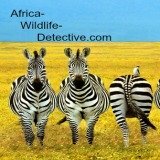 These African animals are highly specialized for a particular style of hunting. Cheetahs use places of elevation such as a termite mound or trees as vantage points to keep a lookout for prey. If cover is available they will use it when stalking. They typically select the least vigilant prey on the fringes of a group of animals. Males track down a female in heat from the smell of her urine. Their first approaches are aggressively rebuffed. During this period the males spray-mark heavily and fight among themselves for mating rights. They also scratch up small mounds of loose soil and urinate or defecate on top of them. After one to two weeks of such courtship the female becomes receptive and she invites copulation by crouching in front of a male. He mounts her from behind with a neck bite. Mating is not as frequent as in other cats. Litters from one to six cubs are born during anytime of the year. 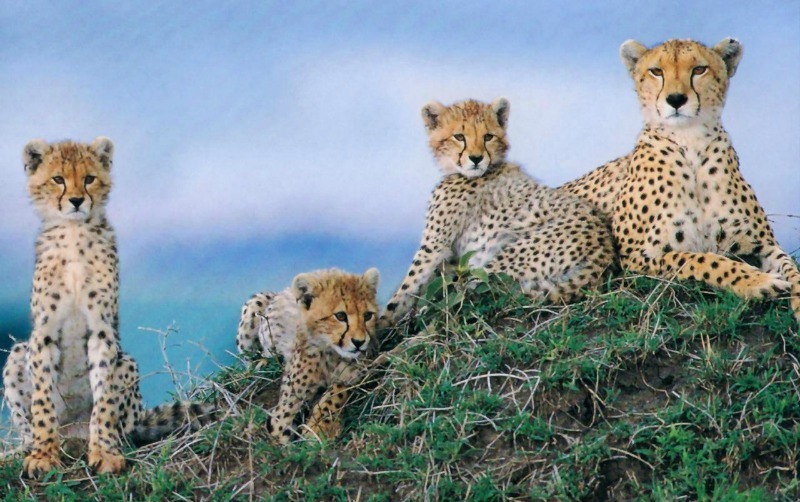 Are cheetah cubs vulnerable to other predators? In the Serengeti lions kill about 70% of the cubs and only 5% live to independence. Cubs are born blind and helpless and are carefully hidden by their mother in dense cover. The cubs are very vulnerable to predation and are frequently moved to avoid predators. 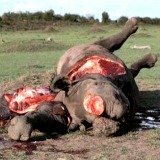 They also fall prey to spotted hyenas and leopards. The cubs get their first solid food at about six weeks and are weaned at three months. At four to five months their mother brings them live prey to practice their hunting skills on. At between six or seven months they begin to make their own kills. For their first three months cubs have a mantle of long, grey hair. It is thought that this makes them look enough like the ill-tempered honey badger (ratel) to dissuade other predators from risking an attack. In February 1999 a South African cheetah called Nyana was officially timed running 100 meters in a record of 6,08 seconds. It accelerated from 0 to 80 kilometers per hour in 3,6 seconds. 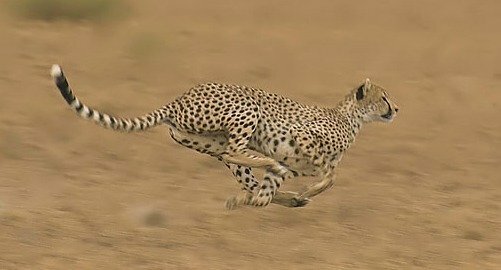 Cheetah hunting prey in Africa is not built for long distance chases but rather for short bursts of blurring speed. Everything form the small head, slender body and highly developed respiratory system contribute to them being known as nature's speed machines. To understand how cheetahs catch their prey, firstly notice how the long and slender body of a cheetah consists of small and light frame. Measures 2 to 3 feet. The tail acts as a rudder for quick turning and balancing. Small collarbones and vertical shoulder blades help lengthen the stride. 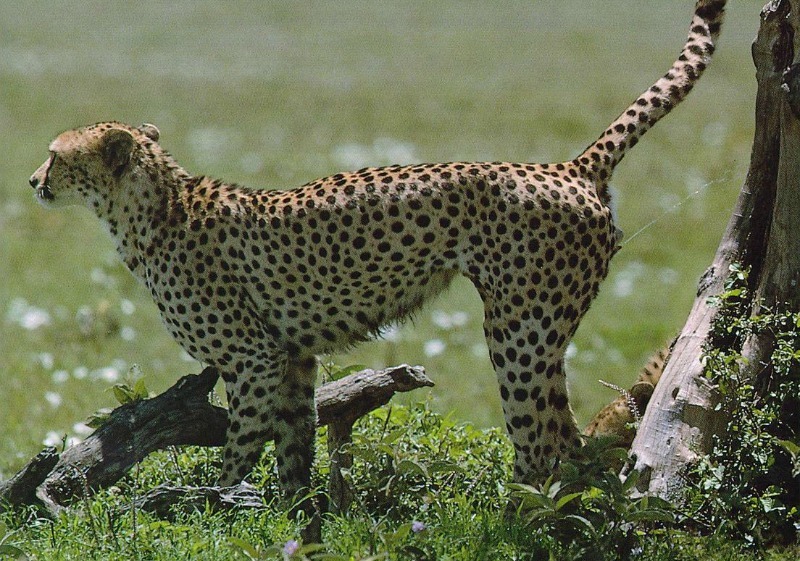 The cheetah spine is very flexible and works as a spring for the powerful back legs to give it additional reach and enables it to move 7 to 8 meters in a single stride. The distinctive dark tear stripe from the inner corner of every eye enhances its visual acuity by minimizing the sun's glare. If they work in a team one cheetah will draw the mother's attack the other will chase the infant. A cheetah hunting its prey will start with a slow stalk. If its prey sees it before it gets within about 100 meter it will give up the stalk because it depends on the element of surprise for success. If it can get within 100 meters it will charge. Their chances of success are better if it can attack from less than 30 m while its prey is still unaware of its presence. They can then be up to full speed while its prey is still getting into its stride. 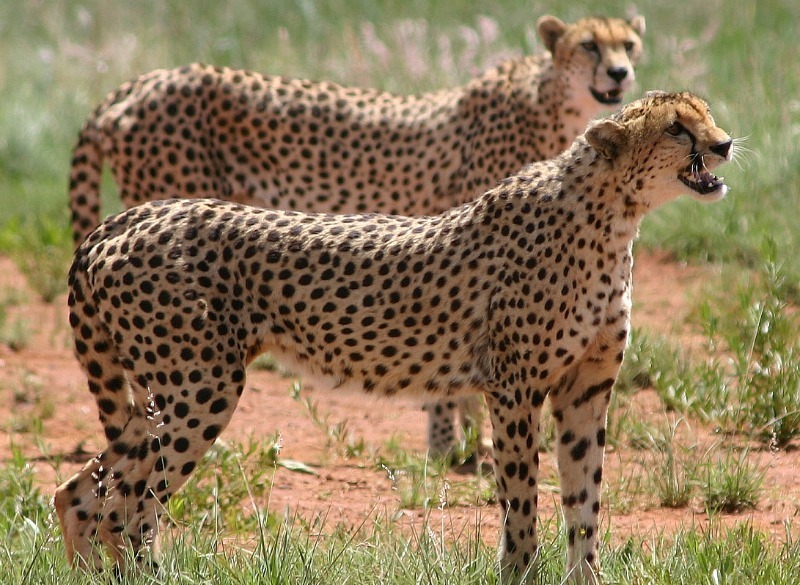 Cheetah chases will lasts for up to 600 meters – they lack the stamina for longer chases. They can keep up full speed for about 500 meters, after which they have to give up the chase. Special paw pads and claws that are blunt and semi-retractable claws provide great traction. Large nostrils and lungs provide quick air intake. This will be followed by an explosive acceleration to a full-speed at 100 to 120 km/h chase. Antelopes can easily outperform cheetahs when it comes to endurance. The most common cause of failure in cheetah hunts is that the prey sees them before they charge. A cheetah hunting its prey trips it with one or both forepaws. When the prey is knocked off balance it gives them a chance to grab it by the throat. It will then suffocate it with a clamping bite to the underside of the neck. Their teeth are too short for the killing bite used by other cats. If there is cover nearby it will drag its kill there to escape the notice of other carnivores and vultures. What animals prey on cheetahs? With its lightweight teeth and skull this African animal has difficulty biting through the skin of even small antelope. It usually starts feeding at the groin where the skin is thin. It eats the meat off one thigh, then the belly, the other thigh and finally the forelegs. They do not eat the skin and intestines of their prey and can chew up only small bones. In the Kruger National Park cheetahs lose 14% of their kills to spotted hyenas.Spotted hyenas, leopards and even warthogs, also steal their kills. Vultures are not only competitors in their own right but also attract the attention of lions and spotted hyenas. They feed quickly before their kills can be stolen. Their light build and small teeth make them very vulnerable to attacks by other predators. 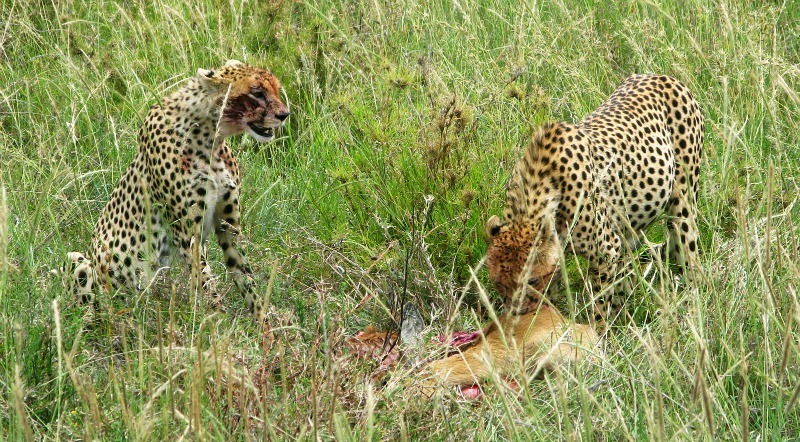 What prey do cheetahs prefer hunting? the young of larger species. 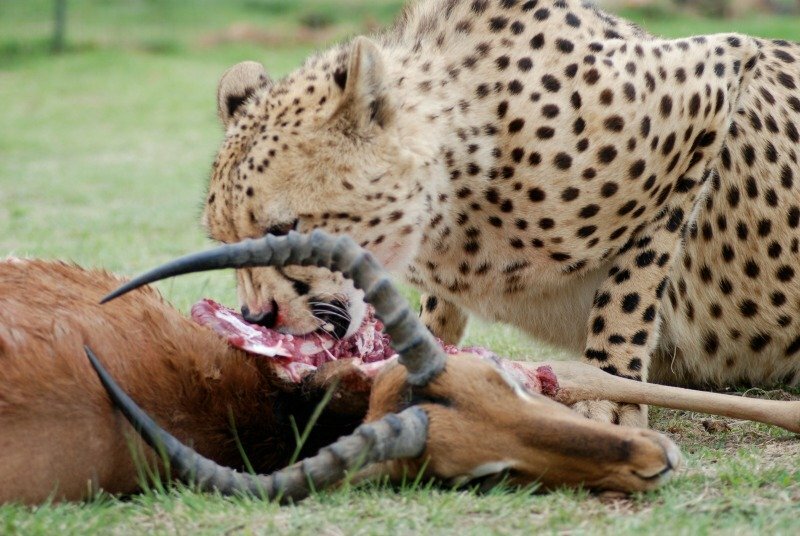 Hunts for large antelope like yearling wildebeest, kudu, waterbuck and gemsbok are successful only when a group of cheetahs operate together in a coalition. In the Kalahari 87% of their kills are springbok. In Etosha 97% of their diet is made up of springbok. They do not usually scavenge. They use high-pitched, bird-like chirrups as short-range greeting and contact calls. They give a loud purr when content. When threatened they give a loud, barking growl and snarl, often slapping the ground with their forepaws at the same time. 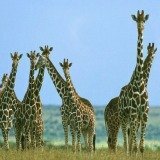 Are these African animals very social? Adult females are usually solitary, but their cubs stay with them for up to 18 months. The males often live in small, stable groups called coalitions. Cheetah coalitions consist of brothers born in the same litter. Cheetah facts indicate that on their own, the males have little hope of establishing a territory but in coalitions they have a good chance of securing turf. This small group will live and hunt together for life. They will claim a large area, which may overlap several female territories. Some males hold territories for up to four to six years. Coalitions are more successful at establishing and holding territories than are single males. 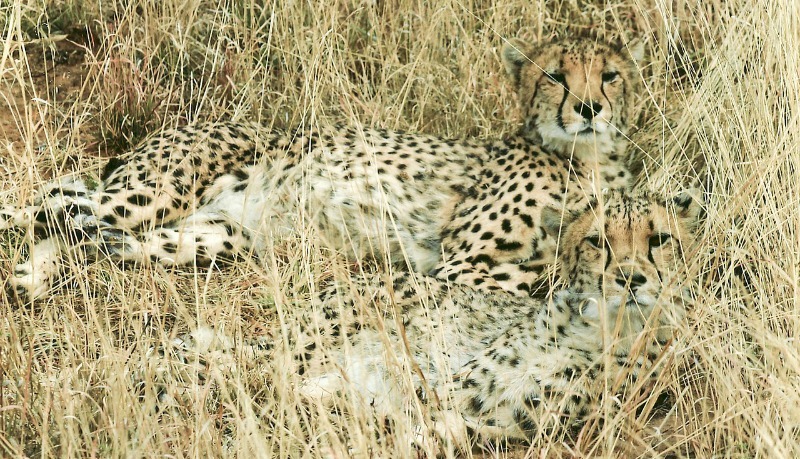 Cheetah territories are scent-marked with sprayed urine. If the marks are more than a day or two old intruders ignore them and so some areas are used on a 'time-share' basis. Trespassers who get caught are savagely attacked and sometimes killed. Large rocks and trees provide traditional marking sites. Please share your feedback, favorite cheetah facts and observations via the comments below.